The day after Mozart and his mother arrived in Paris in 1778, she wrote to her husband in Salzburg that "den wolfgang ist die zeit lang weill er noch kein Clavier hat..." (For the moment Wolfgang is bored because he still hasn't got a keyboard instrument). Twelve days later she reported of their rented room that "der eingang und die stiegen ist so öng das es ohnmöglich wehre ein Clavier hin auf zu bringen. der wolfgang mues also ausser haus bey Monsier le gro Componieren weill dorth ein Clavier ist..." (The entrance and the stairs are so narrow that it would be impossible to bring a clavier upstairs, so Wolfgang has to compose away from home at M. Le Gros' place, because there is a keyboard instrument there.) Three years later Mozart, in Vienna on his own, wrote to his father, "Mein zimmer wo ich hinziehe ist schon in Bereitschaft; —izt gehe ich ein Clavier zu entlehnen, denn, bevor das nicht in zimmer steht, kann ich nicht darinn wohen, dermalen weil ich eben zu schreiben habe, und keine Minute zu versäumen ist." (The room into which I'll be moving is already ready —I'm going now to rent a clavier, for if there isn't one in the room, I can't move in. Since I have much to compose right now, I don't want to waste a minute!) These passages strongly suggest that Mozart required his clavier to compose—perhaps to invent and develop ideas by improvising, perhaps also to experience physically what he had heard in his imagination. 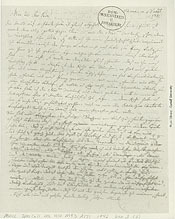 [top two images] Letter by Mozart's mother, Maria Anna, to her husband Leopold. Paris, April 5, 1778. [lower two images] Letter by Mozart to his father. Vienna, August 1, 1781.